I'm not really sure if it's the Facebook ads I've been putting out lately, or maybe it's the new site design, but the feedback for the site in the past month or so has been at an all-time high in terms of positivity. Blogging is a little bit of a lonely business in the beginning (if you are doing it full-time), because you have all of these people that are reading but rarely have anyone reach out to you or comment on posts. The cool thing about Facebook is that it's ultra conversational, so I've been able to engage with what seems like thousands of people on that platform! Admittedly it is a little draining sometimes trying to get to every comment, but I feel that if a reader takes the time to react to my post, the least I should try to do is read it, like it, and comment as well. I REALLY appreciate all the interaction so far, and I love getting to chat with all of you online. An example of how awesome this is all getting to be: I did a simple Facebook post asking what kind of cars you all drive, and got 300 responses. I couldn't even keep up with them haha. M$M is turning into what I always dreamed it would be! A lot of personal finance bloggers start their sites with the mission to “empower” people with their money (still not 100% sure what that means but I know it works for a lot of influencers). I'll be honest – there are a lot of fancy reasons that I could make up for why I started blogging. But really, it's pretty simple. I just wanted to talk about money with people who didn't think it was taboo or weird. I also wanted to have an environment where people could share their successes and have other people be genuinely happy for them. Money can be a pretty divisive topic, and a lot of the time the people like us who want to drive crappy cars or pay off their loans early are frowned upon because we're not even close to the norm. Kinda weird to write that out, but it's true! I didn't know jack about money when I graduated from college. I was going to make minimum payments on my student loans, buy a new Camaro as a reward for graduating college (seriously), and buy a house WAY too early. Then, one day I went boating with my wife and a family friend of hers. Everything changed for me. Over the past few years I've been fortunate to become closer with the friends that I've met out on the water, and we regularly started hanging out and having these awesome conversations (this is where the beer comes in) about money. I have two financial friends/mentors named Mike and David that have allowed me to stick around and pick their brains about debt, all types of investing, life, etc. That relationship with them spun off into me deciding to pay off my student loans early, quit my job to run this site, and grow M$M into a sustainable business that currently reaches over 100,000 people a month. The honest reality is that 90% of the people (or more) around us don't give a crap about personal finance. It's always surprised me because it's such a big part of our lives. My goal was to create a place and community where people want to put it all out on the table and talk about money so we can all just have a better quality of life. I've seen hundreds of awesome debt-payoff stories, you've talked to me about your families, and shared a part of your lives with me. I mean…just the fact that anyone would share something as important as a zeroed out loan balance with me is incredible. That put a smile on my face for a LONG time after I saw it the other day! Your cool life stuff, the amounts you've paid down on your loans, old cars you drive, etc. are the reason that I've been so passionate about growing this site. If you keep sharing, I'll keep putting out the best content I can to help you make it to wherever you want to go. What financial achievement are you most proud of so far? For me it was paying off my student loans! Our biggest accomplishment so far has been paying off one credit card, one vehicle, and one of my wife’s student loans. These weren’t huge amounts to pay off, but the feeling of not having that payment anymore is such a rush, and relief. We’re on our path to getting out of debt and seem to be picking up speed. Can’t wait for the next milestone! Nice!!! Yeah that feeling is hard to describe – I get a lot of people that think paying off debt is the wrong choice, should be investing, etc. Hard to agree with them after knowing how making my last student payment felt. Awesome to see your continued success, and I agree completely about how awesome it is to open up the discussion about money. On paper, the financial achievement I’m most proud of is saving up a $170,000 portfolio. But if we’re being real, I’m probably even more proud of building up a community where I can help others. Like you said, there’s no more rewarding feeling than a reader sharing their story. I totally feel the loneliness of early days of blogging. You inspired me to start and keep inspiring me to continue. I would say my biggest accomplishment is retraining how I think about my personal finances. My current challenge is my credit card relationship. Five years ago I had no idea I had bad habits and what trouble they would get me in. It has taken 1.5 years of reprogramming to just get a quarter of the way to where I think I should be. I can see the improvement and if it takes me 6 years total, that means at least 6 times that of healthy habits. That’s great to hear! Yeah this personal finance stuff just takes time. Since November, my wife and I have retired over $24,000 of debt! She is a stay at home mom, and I make about $60,000/year. That’s so relieving to me! I have about $7,500 of student loans left and we’ll be debt free other than the mortgage! By the way, my wife’s name is Coral too! Woah that’s a weird coincidence! Very rare name (she always has to tell people what it is twice haha). You guys are so close with the loans – congrats! We always tell people, “Like coral reef” and that she’s from Florida, then people go, “Oh that makes sense!” lol . Thanks man, you have been an inspiration for us. Keep up the good work! I’m 100% with you on the Camaro thing. I thought I could get myself a Cadillac CTS after getting my first job. Absurd. And we’re supposedly smart guys. Biggest achievement so far was saving up a half year (then ultimately a few years) worth of expenses to chase the entrepreneur dream. 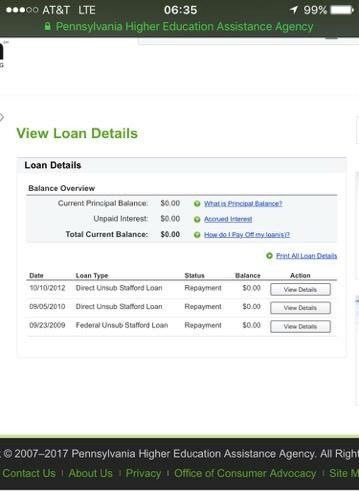 BUT THE BEST FEELING has been paying off each student loan. That’s a rush each time. Ah that’s awesome! Yeah I go back and read that one from time to time to keep it all in perspective as well. Oh, I don’t really talk about money IRL, even with my mother who’s a math teacher and has a management degree. Though, she does support me starting my own business because she and my father did the same thing when I was 9. Guess I was meant thinking carry on the family entrepreneurial trait lol. My biggest achievement is finally paying myself. I went to my bank and I filled out some easy paperwork where every time I get a payckech, they automatically deposit $100 into my savings. I never see it, so I never miss it! Thanks for the kind words Christa! I’m probably most proud of being so close to paying off our mortgage. Bought for $185K in 2008, and only $67K left on the mortgage. I turn 33 this month, and the idea of being debt-free in the next few years, well before I’m 40 is thrilling. Awesome to see your success and continued growth! You were a big motivating factor in starting our own website. We agree it’s incredible to get feedback on content you post. “Wow these are great tips thanks for the help” goes along way. Blogging is a great platform to not only express yourself but really set out to help others. It’s incredible for interesting and sharing thoughts and ideas like you said before. One of our favorite topics is cars as well. It was great to find out there are more people like us driving rusted out old cars. My wife Brittany drove a 2005 Chrysler Town & Country for the last 5 years and never complained. We have no kids so driving around a van in your early twenties is not the most glamorous thing. But it gave us freedom to travel more by not having a car payment. Always look forward to your content coming out. Thanks for the movitaion! Forgot to mention our favorite financial success so far in our life. We were able to knock out my student loans 3 months after graduating (small amount of debt). We were also able to move out of our parents and into our own house at 23 years old. Reading your articles has me amped to get back on track. I am most proud of buying my first home by 30 and paying it off by 38. By doing this I have had a lot of freedom outside of a regular job with renters paying for my lifestyle. This steam rolled into 16 transactions and then a divorce stalled me out and changed my financial picture. I am now back up and running a close on an investment condo this Friday! Thanks for lighting the fire… again. Thanks Carrie, so glad you like the site and have found it helpful! It’s weird to think how many people a website like this can help. Great job growing the blog, M$M. 🙂 It’s not an easy thing to do! Haha yeah it is definitely hard!!!! I really wanted a 3 series BMW when I graduated college.. I actually went and test drove one. For me, I was getting a size able auto allowance. Luckily, I thought rationally and purchased a year old Hyundai Sonata (part of the auto allowance policy is to drive a newer car.) I paid that bad boy off quickly and I pocket most of the monthly auto allowance! Our biggest accomplishment was paying off my student loans as well! We are now tackling J’s student loans, which we are HOPING to pay off by December of this year. If we succeed (which, I think we will), we will have paid off over $73K in 31 months!! 1. Wiping out $200k of debt nearly 2 years ago – no more slavery to lenders. 2. Staying completely out of debt since and forever after. There is an overwhelming sense of freedom that comes from not owing a nickel to anyone. 4. Opening a brokerage account and earning serous compounding on investments rather than the measly saving account returns. 5. Crossing the $400k net worth threshold in feb 2017. 6. Peace of mind – priceless. Same: paying off $200k on student loans. Will never forget that feeling. Freedom from debt is powerful.